During Proposal Week, all seniors at Tristan University are fake proposed to, from boy to girl. Each boy is given a piece of paper with a fellow senior girl's name on it. 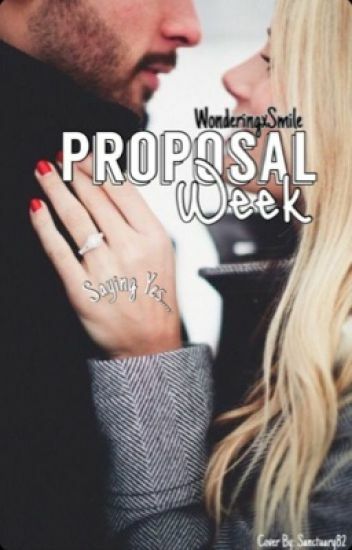 In one week, the boy has to come up with the next to most sincere proposal that they can conjure up in a week. Then, they perform the proposal and video it for proof. The girl doesn't know who the boy is until they are proposed to. This does propose drama, when one girl may have been proposed to twice, leaving a girl with no proposal. After that, the girl has to wear the ring for at least a week. That's if the relationship between the guy and the girl are more than just partners for a project. Let's just say, Proposal Week just got hectic with everything and more Ryla has to do. Two: She's Not Sick or Something, Right? This is the first book in the FOREVER Trilogy and the second book is out now! Ever Radke is a quiet teen who is easily engrossed in music and books. When her mother dies in a car accident, Ever and her father move to a small town called StoneCreek. Little does she know that her life will be changed forever- For better or for worse? There she meets an intriguing  boy named Damien. There is something very interesting about Damien that drives Ever crazy about him, in good and bad ways. But then two more equally mysterious boys enter her life: Dakota and Azriel. Who will she chose when it's all over? This is the first book I wrote on Wattpad and though it's terribly written and two years old, for sentimental reasons, I'm not gonna delete it and I'm going to carry out my original dream of making it a trilogy. Thank you so much for even clicking on this story it really means a lot to me! I did not plan on stumbling into the middle of a movie shooting. I did not plan on commenting how poor the acting of the lead female was. And I most definitely did not plan on finding myself speaking the lines in her place, opposite none other than Adrian Carter, the teenage heartthrob of Hollywood. But if anything in this universe ever went according to my plan, then the lead protagonist in the horror movie I was watching wouldn't have died by opening the damn door when I clearly asked her not to. But oh well, problems seemed to be attracted to me like the opposite ends of the magnets. Addison Woods is a seventeen year old who has a strong passion for acting. Being the daughter of the world's most renowned movie-set and graphics designer, she has always been in touch with this industry all her life. So what happens when, after losing a bet she is asked to spend a night in the spooky mansion, where she finds herself speaking the lines of the lead female instead? But if you think that she becomes a star and her dream comes true so easily, you're dead wrong. Because Addison never liked it easy. So, will this incident set her life straight, or will it actually turn it upside down? Why does a story have to be about a bad boy and good girl? Why does the guy always have to be bad? Why can't the story be about the good guy and the good girl? Skylar Greene isn't someone you would consider popular. In her free time she would rather spend her time in her room reading a Nicholas Sparks book, sleeping, watch re-runs of old tv shows, listening to Ed Sheeran or fangirling over superheros. She is awkward, lacking social skills, and is shy at times but rambles when she's nervous. She is so clumsy she is literally falling through life. Noah Miller is someone you would definitely consider popular. He has the looks and is the best football player on the schools team. He isn't your typical popular guy who is rude to people who aren't popular. He is actually extremely nice to everyone which is why everyone loves him. He loves meeting knew people and having fun. When Skylar and Noah meet in the nurses office one day, everything changes. Noah takes interest in her and drags the socially awkward girl to parties, football games, and even gets them in trouble with the cops. But he's only trying to show her a good time. Soon enough Skylar finds herself falling for this guy. They start telling each other things they never told anyone before. Skylar actually thinks he likes her back and it can work out. But when series of unfortunate events happen everything changes and Skylar doesn't know how anything will turn out. Is falling for Noah Miller something she will end up regretting or something that will all be worth it in the end? An internationally known actor and singer isn’t something you see every day, walking down the halls of your school. But for Rosalyn and every other student at Vinova Academy, it was. Alongside that was the fact that he was part of the 'Powerful Trio' of Vinova; a trio with looks that could counter a Greek God and was, well, powerful. When wallflower Rosalyn Clarke suddenly catches the attention of this 'trio', she finds herself mixed into a drama and romance filled high-school life that she wanted to completely avoid, after a drama-filled freshman year. But in the midst of it all she finds that whatever the Powerful Trio wants--it gets. Or maybe it's just a matter of time that all of that changed. "When you lose someone, someone you love, it's the hardest thing you can ever go through. With time, it never really goes away. You think you're healing, but then you get a flashback, or hear a song bringing back memories, and it hits you all over again, like a stab in the chest, you fall apart for the hundredth time and out yourself back together the hundred and first time"
What if you lost everything in life that mattered the most to you in a matter of seconds? Just let what you loved most, slip through your fingers in the blink of an eye. Odette Thompson had everything she wanted, good parents, a protective brother, an amazing dancer and a straight A student. In a matter of seconds she loses everything. Her parents, her happy life, two things that mattered most to her, lost. As she begins to lose herself, she runs into what seemed like to be her own guardian, protector, and a personal annoying egotistical knight in not so shiny armor. Everything changes once she meets Jasper, Captain of the varsity soccer team, gorgeous as hell, stormy blue eyes, the bad boy air. Can Jasper break down Odette's walls before she has them completely built up? What happens when two best friends finally fall in love? It all began with that teacher strike. Which resulted in a stupid senior project. You know the cliché get-to-know-your-partner project that every senior student gets in books? I thought it was supposed to remain in those books. I never imagined that teachers would actually assign it! With my brilliant luck, I got assigned to a partner whom I soon found myself trusting more and more. And I happened to have secrets that were better kept hidden. Hello! So disclaimer, the cover of this book was most definitely not drawn by me. All rights goes to the artist of the drawing. Another disclaimer, I am not the best artist. Most of these pictures are sketches & are not really good. But I like to draw, because it's fun, not because I'm good at it. Ever heard of the story where the football player gets the cheerleader? Or the one where the football player goes for the stereotypical nerd? Aren't those so cliche? But aren't the cliche love stories the best kinds of love stories? I have this theory where if you want a cliche story, you have to become apart of the cliche. Become that cheerleader, become that nerd anything to get the guy. But here's my problem, I can't become that cliche because too much is riding on that line. To make it worse I'm the kicker on his football team. So to him I'm just "one of the guys"